As June settles into the Space Coast it should bring calm winds and the humidity-laden days that lead to afternoon thunderstorms. Late seasonal fronts will have stopped, and eyes are starting to look for the first signs of tropical weather. June is also one of the last months that lagoon waters are cool enough for Redfish and Sea Trout to feed all day. Bait pods are within striking distance from all of Brevard’s beach launches. Many Cobia, Tarpon, Kingfish, and large Jacks have recently been caught just outside the surf line. The bait and amounts of predators will only increase as the beach waters warm with summer. Some snook have started showing on the beaches and jetty’s around Port Canaveral or Sebastian Inlet. Numbers of these pre-spawn fish will only increase too! A summer high tide bite also occurs on the worm rock reefs off South Brevard’s beaches. Cast large top-water plugs for vicious strikes from heavy snook laying in the cracks and crevices. LAGOONS The summer sea grasses are growing thick and tall in the Space Coast lagoons. Redfish, Sea Trout, and Snook will lay in the holes and on the edges of the matted grass that stretch to the surface in 1 ½ foot or less of water. Bass fishing inspired weed-less soft plastic rigs, like Saltwater Assassin jerk baits and paddle tails rigged on Mission Fishin weed-less hooks, will allow kayak anglers to effectively pursue game fish in this weedy labyrinth. A kayak is the best type of craft to hunt these fish from, and it will allow you to stalk the finning, tailing, and laid-up fish. Game fish in this scenario will lie in a hole and blast finger mullet as they swim by. So investigate any blast thoroughly. The fish that has just eaten won’t venture far. Work your weed-less soft plastics through the weeds paying special to holes and edges of the surface mats. NO-MOTOR-ZONE (NMZ) The outside bars and drop offs of the NMZ have greeted my clients with several over-slot Redfish per trip; with some topping 40 inches. Though not the most exciting way, but the most effective way to catch these bruisers is to soak large cut baits. 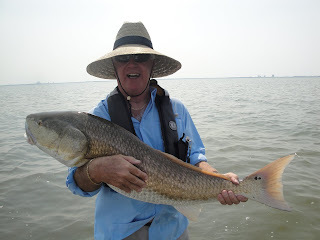 Large mullet, Ladyfish, and half a blue crab are all great choices for cut bait. Just remember to use a large piece; small cut baits will have you fighting catfish instead of big Reds. Areas with shallow grass flats next to deep sandy drop-offs will act as highways for large, cruising Reds. Place several baits in your location, and give each spot about 30 minutes before moving. Again, I stress large cut baits that catfish cannot swallow. Check your baits periodically (especially crab) to be sure that Pinfish have not picked you clean. I prefer medium tackle in the 15-20 pound class with a 3 foot section of 40 pound mono, and a 5-6/O circle hook for the business end. These are big fish, and you don’t take a BB gun to shoot a Rhino! Tight lines and wet paddles!